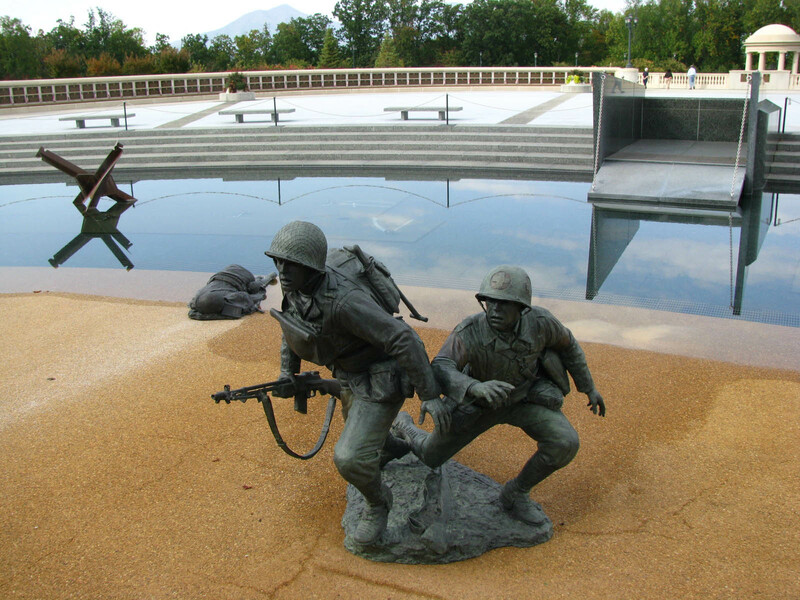 Introduction: Dedicated by the President of the United States on 6 June 2001, the National D-Day Memorial at Bedford, Virginia, exists in tribute to the valor, fidelity, and sacrifice of the Allied Forces on D-Day, 6 June 1944. The National D-Day Memorial Foundation, incorporated in April of 1989, maintains and operates the Memorial under the provisions of Section 501(c)(3) of the Internal Revenue Code. Since its dedication, nearly a million people have visited the Memorial, and more than 75,000 school children from nine different states have participated in the Foundation’s annual cycle of educational programming. For the last three years, the Memorial has been one of Virginia’s top twenty-five educational attractions, which include such sites as Colonial Williamsburg, Mount Vernon, and the Virginia Museum of Fine Arts. Much of the Memorial’s success as an attraction owes to the importance of the story it tells. 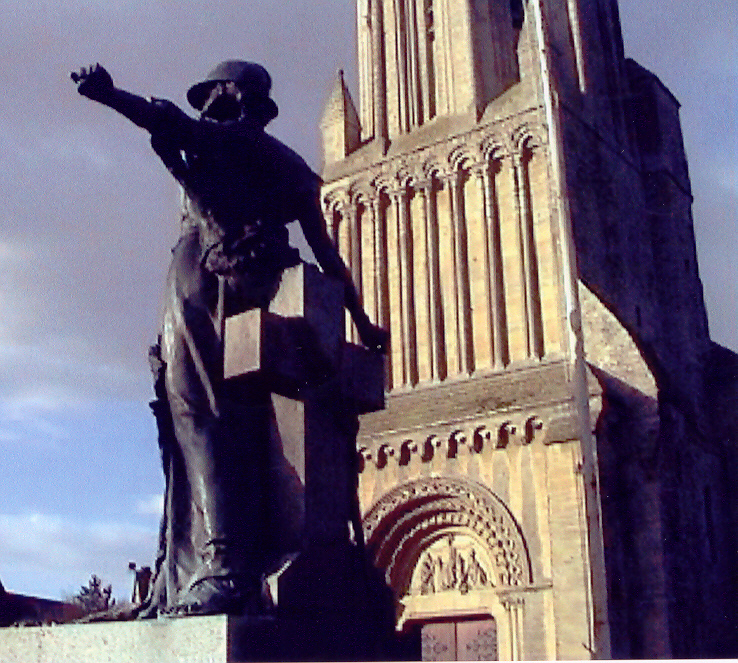 D-Day was, after all, the watershed event of the last century; virtually everything else flows to or from it. However good a story, the degree to which it can draw and hold an audience owes as much to the telling as to the tale. 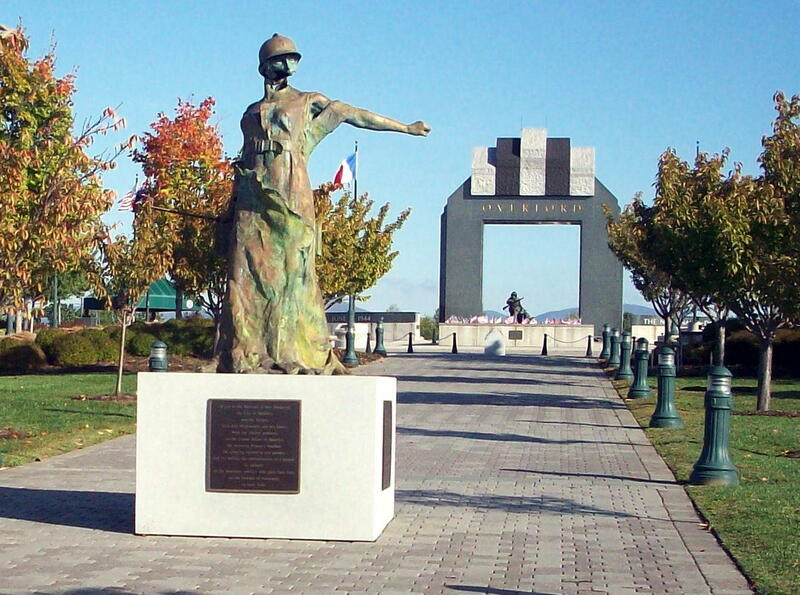 The National D-Day Memorial tells its story well — in considerable measure because of its integrated decorative program. As opportunities and resources permit, the Foundation implements aspects of the decorative program to enhance further the setting that frames the story’s telling. 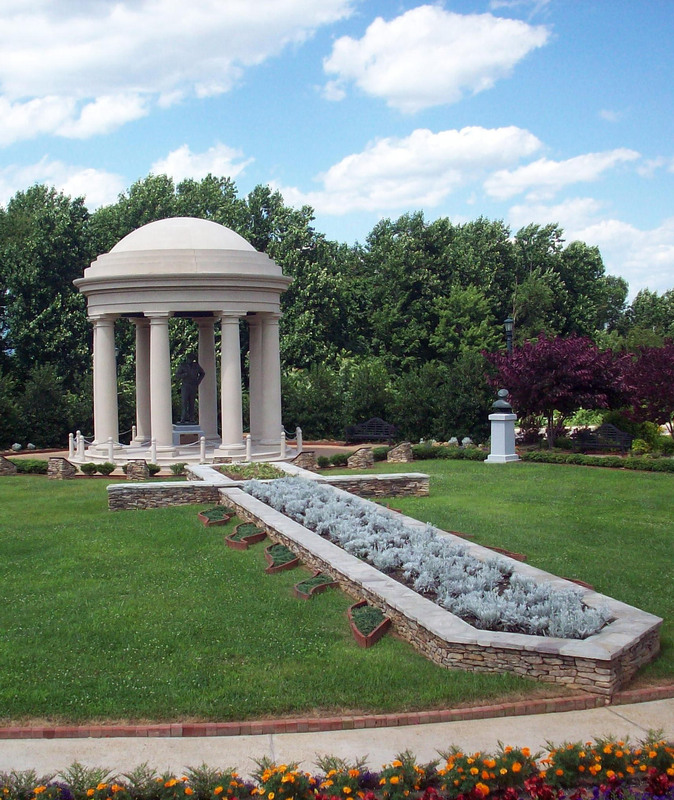 Among the growing number of enhancements to that setting are scores of bronze narrative and necrology tablets emplaced around the Memorial. Reaffirming the old saw about the relative value of images and words, the OVERLORD Sculptural Program, which usually employs the heroic scale of 125% to life, dramatically complements those tablets. From the Memorial’s first day of operation, the figurative sculpture that enlivens the assault tableau in Elmon T. Gray Plaza has been one of its most compelling features. 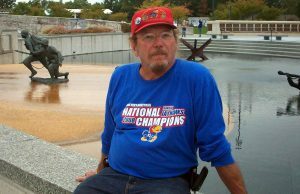 The work of Kansas artist Jim Brothers, those figures are central to the sculptural program’s first stage; so is the work of Matt Kirby, another Kansan, who sculpted the hedgehogs (i.e. the obstacles in the assault tableau) and the inverted M1 Garand Rifle emplaced on Robey W. Estes Plaza. A bittersweet reminder of both France’s victory in the Great War and the blood spilled to secure it, Le Monument aux Morts stood for scarcely two decades before finding itself surrounded by a new generation of invaders. Shortly after the Allies came ashore on D-Day, Germany’s 915th and 916th Infantry Regiments, 517th Mobile Battalion, and the Reconnaissance Battalion of the 352nd Division established heavily fortified positions in and around Trévières. On 9 June, the 9th and 38th Infantry Regiments and the 38th Artillery Battalion of the US 2nd Infantry Division assaulted the village, which for the two preceding days had been under fire from the 14-inch guns of the USS Texas. The bell tower of St. Aignan sustained major damage on 8 June, probably a result of the naval gunfire. Perhaps Laheudrie’s sculpture took damage at the same time, or it may well have been damaged during the ground attack on Trévières, during which, for example, the 38th Artillery Battalion expended more that 3,600 rounds. German counter fire also may have been a factor. Whatever its source, shrapnel or a round struck the head of the figure and removed its face below the upper lip along with most of its throat. Preserved as transformed by battle, Le Monument aux Morts, at both Trévières and the National D-Day Memorial, is a spectral testament to the destructiveness of war, evanescence of victory, and fragility of peace. Literally a part of the D-Day story the sculpture in stage one has been commissioned to tell, it is emplaced on Edward R. Stettinius Parade. The evident contrapposto in this work is less pronounced than the flamboyant postures of Jim Brothers’ Scaling the Wall, whose inspiration was the 2nd Ranger Battalion’s historic assault on Pointe du Hoc. Whether by accident or design, the contrapposto of Scaling the Wall encourages comparisons with the Hellenistic treatment of Laocoön and his sons in torment (both are shown below). Their respective backdrops, D-Day and the Trojan War, demand treatments that are epic in scope, action, and character. That the contrapposto of Across the Beach is more restrained than that of either Scaling the Wall or Laocoön paradoxically magnifies the psychological tension at the core of the newer piece. For example, the physical contrapposto of Across the Beach reverberates in the sculptor’s deft juxtaposition of stage props that emphasize the contradictions at work in the mini-drama he depicts. Abandoned on the beach between the two figures is a Garand M1 rifle that belongs to neither. That it does not encourage any number of obvious questions about the missing soldier. The advancing trooper carries a Browning Automatic Rifle (M1918A2 BAR) whose effective rate of fire is 550 rounds a minute, many times that of the M1 Rifle; the medic, of course, has no weapon. The presentation of such contrasts also invites a range of questions, and that speaks volumes about the sculptor’s control of his subject matter as well as his skill as an artist. Underwritten by Mr. and Mrs. E. Claiborne Robins Jr., Across the Beach was set in the assualt tableau Veterans Day 2008. Across the Beach replaced the existing dual sculpture of the same name. The first Across the Beach was moved back to its original location (shown below left), which is the large planter on Estes Plaza, and allegorically renamed Valor, Fidelity, Sacrifice. These emplacements conclude the first stage of the sculptural program. Sculptor Jim Brothers pauses at the assualt tableau after setting Across the Beach. Foundation photograph, October 2008. The program’s second stage got underway in January of 2006 when the Foundation, after a six-year delay, authorized Mr. Brothers to proceed with the casting of The Supreme Commander, a full-figure, heroic-scale portrait of General Dwight D. Eisenhower, Supreme Commander of the Allied Expeditionary Force (AEF). Though emplaced on its pedestal in May 2006, this much-visited and highly praised addition to the Richard S. Reynolds Garden of the National D-Day Memorial will remain undedicated until a donor underwrites it. With the exception of that particular monument, which was part of a larger project, the Foundation does not commission unsubscribed sculpture. Fortunately the sculptor’s understanding of and commitment to the OVERLORD Sculptural Program is such that the balance of stage two — six portrait busts for emplacement in Reynolds Garden — could be completed in under eighteen months. Indeed, Mr. Brothers has already done some of the preliminary drawing and modeling for that series. A stylized adaptation of a formal English garden, Reynolds Garden is the component of the Memorial that draws attention to the planning and preparations for D-Day, the Allied assault on occupied France, 6 June 1944. Primarily focused on the men and women who planned the Normandy invasion and oversaw the marshaling and training of the AEF, Reynolds Garden provides, as do the Memorial’s other major components, a contextual framework for understanding the lessons and legacy of D-Day. It is named in memory of the visionary industrialist-poet who foresaw his country’s inevitable need for aluminum. During the late 1930s Richard Reynolds responded to that need by putting his fortune and reputation in the balance to produce enough aluminum for the United States to build and sustain the air force that gave the Allies overwhelming air superiority for D-Day. At the Casablanca Conference of January 1943, the Combined (i.e. Allied) Chiefs of Staff directed the formation of a British and American authority called Chief of Staff to the Supreme Allied Command (COSSAC) to continue making plans and preparations for the invasion of France, a process that since late 1941 had generated several plans for cross-Channel landings. On 17 April 1943, British Lieutenant General Sir Frederick E. Morgan, K.B.E., convened his combined staff to revise and consolidate the existing invasion plans in light of the lessons learned from the intervening Mediterranean operations. In July, COSSAC completed the Appreciation and Outline Plan for OVERLORD, which was approved at the Quebec Conference in August. Over the ensuing months, most of the COSSAC staff was absorbed by the Supreme Headquarters, Allied Expeditionary Force (SHAEF). Appointed Supreme Commander on Christmas Eve of 1943, General Dwight D. Eisenhower assumed command on 15 January 1944. More than a year earlier, General George C. Marshall had made him Supreme Commander of Operation TORCH, the Anglo-American invasion of North Africa. Success of TORCH had depended not only on the harmonious cooperation of the combined commanders and staff but also on the enlistment of the defeated Vichy French to preserve civil governance and order in the very territory the Allies had liberated from them. Such unique experience, buttressed by General Eisenhower’s firm understanding of the exceptional complexities and challenges of leading a combined force in joint operations, augured well for his command and the outcome of Operation OVERLORD. The plans that COSSAC incorporated in the OVERLORD Plan had been drawn up for several projected cross-Channel operations: WETBOB, SLEDGEHAMMER, ROUNDUP, and ROUNDHAMMER among them. Prime Minister Winston S. Churchill’s sense of history and drama foreclosed on the association of any of those pedestrian codenames with an endeavor of D-Day’s epic scope, but on the list of several hundred pre-approved codenames one did stand out: OVERLORD. Redolent with echoes of chivalric quests and crusader knights, OVERLORD hit the mark dead center. 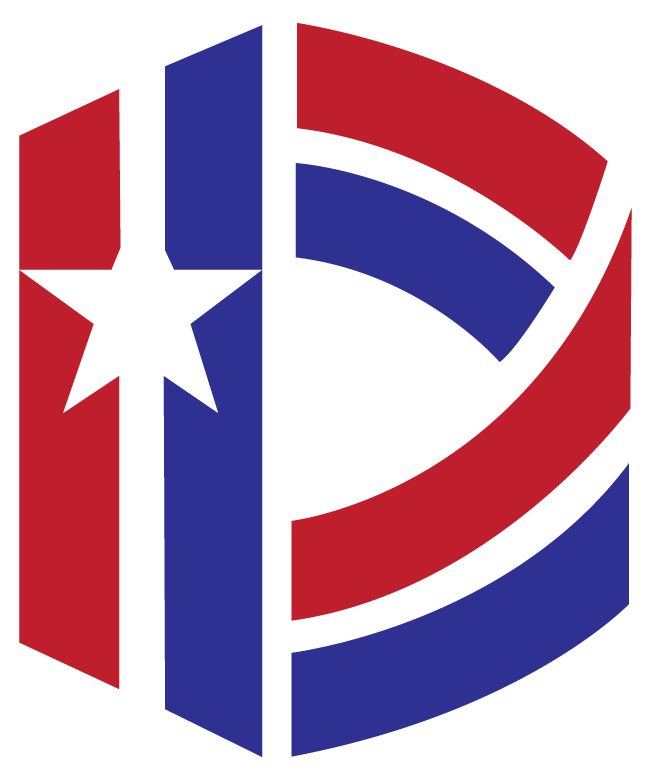 The shoulder patch General Eisenhower adopted for SHAEF literally embroiders Churchill’s theme. 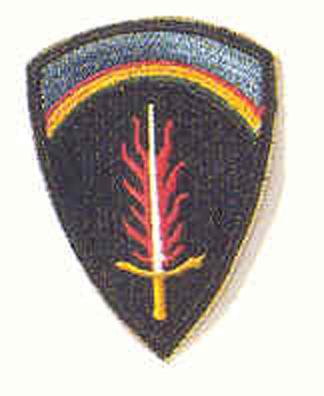 The SHAEF patch takes the form of a black (for Nazi oppression) crusader shield decorated with a flaming sword of expulsion (cf. Genesis 3:22-24) centered beneath a rainbow that comprises the colors of the twelve nations of the AEF. In his Order of the Day for D-Day, the Supreme Commander leaves no doubt about his vision of the operation. “You are about to embark,” General Eisenhower begins, “upon the Great Crusade, toward which we have striven these many months.” That he later opted to call his postwar memoir Crusade in Europe reveals the lasting appeal the metaphor had to him. Within a domed Tuscan folly located at the north end of Reynolds Garden, the bronze sculpture of General Eisenhower stands canopied by a mosaic after the D-Day battle map in the operation center at Southwick House. The classical-revival lines of the folly allude broadly to the architectural vocabulary of Southwick House, Southampton, England, where Eisenhower took the decision to launch D-Day on 6 June despite the difficult weather. Inspired by a touching photograph of the Supreme Commander’s avuncular conversation (about fly fishing!) with Lieutenant Wallace C. Strobel of Company E, 502d Parachute Infantry, 101st Airborne Division shortly before it deployed from Greenham Common, Brothers’s intimate portrayal leavens Eisenhower’s generalship with a measure of understated humanness that speaks volumes about the public-private dichotomies that inform command. If such a characterization humanizes this epic protagonist, it also documents his worthiness to serve as the Supreme Commander. The full-figure portrait, draws attention to his distinct role, a role emphasized as a matter of sculptural form, by the contrasting presentation of portrait busts of the six officers in Eisenhower’s command group. As if emanating from the right and left hands of the Supreme Commander, Eisenhower’s lieutenants will be set, in accordance with conventional precedence (as shown in the photograph below) upon granite pedestals already emplaced along the perimeter of a central area planted to echo the design of the SHAEF shoulder patch. Deputy Supreme Commander Air Chief Marshal Sir Arthur William Tedder, Naval Commander Admiral Sir Bertram H. Ramsay, and First U.S. Army Commander Lieutenant General Omar N. Bradley will appear along the path to General Eisenhower’s right front; Ground Forces Commander Field Marshal Sir Bernard L. Montgomery, Air Force Commander Air Chief Marshal Sir Trafford L. Leigh-Mallory, and Chief of Staff Lieutenant General Walter Bedell Smith to his left. 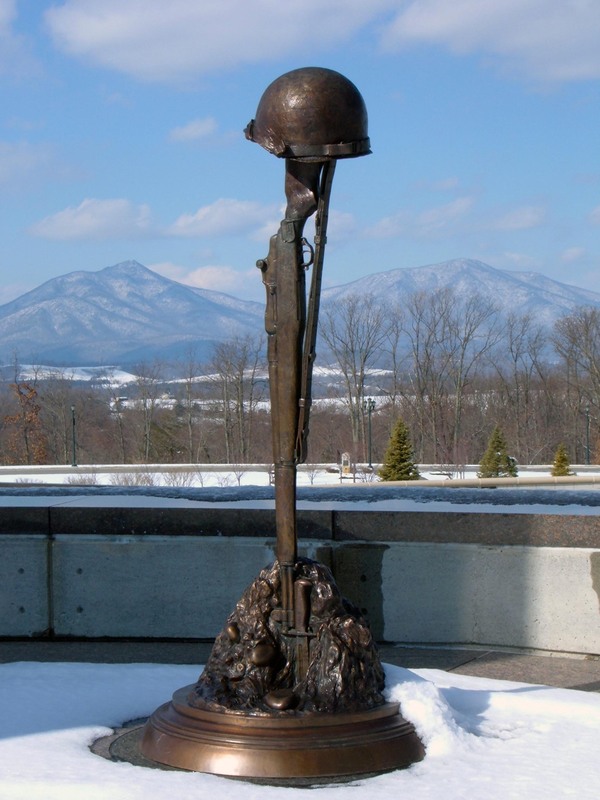 When the portrait busts of Ike’s six lieutenants have been subscribed, the Foundation will be in a position to proceed with the third stage of the sculptural program, which includes the emplacement of additional portrait busts at the four entrances to the northern quadrants of the Memorial. The busts will be set upon granite-capped, concrete gateposts. The two gateposts nearest the garden will carry portraits of Sir Winston S. Churchill and President Franklin D. Roosevelt, to the northeast and northwest respectively. At the eastern entrance of the walk leading to Elmon T. Gray Plaza, the action on the European Theater’s eastern front will be acknowledged with a portrait of Marshal Joseph Stalin, General Secretary of the Central Committee of the Communist Party of the Soviet Union. The bust emplaced at the entrance of the western walk to Gray Plaza will portray Generalissimo Ji-ng Zh-ngzhèng (Chiang Kai-shek), President of the Republic of China, and thereby draw attention to concurrent operations affecting the Pacific Theater. President Harry S. Truman and the Rt. Hon. Clement Richard Attlee, Churchill’s successor, are the subjects of two busts to be set upon granite pedestals located to the east and west of the flagstaff at the southern end of Edward R. Stettinius Parade. Those additional portraits will function as the Memorial’s most accessible touchstones for framing the lessons and legacy of D-Day in context of the global landscape of the Second World War. From 1941 through 1945, each of those leaders attended one or more of the strategic conferences of World War II. It was during those meetings (at Quebec, Cairo, Tehran, Potsdam, etc.) that the operational policies for winning the war and securing the peace were articulated and adopted. To recognize the variety of missions, equipment, and deployments of the naval and air forces in support of D-Day, the fourth stage of the OVERLORD Sculptural Program relies on small (30 inches by 20 inches) bas-relief panels. This narrative medium permits the Memorial to address the broad range of action and matériel that heroic-scale statuary alone cannot treat. Set in proximity within their respective memorial spaces, the smaller reliefs will gloss free-standing figurative types representing both services. Emplaced in the center of the circular areas east and west of Gray Plaza, the sculptural tributes to the air force and navy will provide both monumentality and detail. The bas-reliefs for the air force will include, among other things, strategic and tactical bombing, the engagement of fighter aircraft, medical evacuation, the delivery of airborne troops, flak, and the massiveness of D-Day’s operational scale. Subject matter for the navy’s panels comprises delivery of troops, artificial harbors, naval gunfire, beach preparation, logistical support, and naval medicine. The reliefs for the National D-Day Memorial, if focused and sized differently, will be tonally comparable to those of the National World War II Memorial and U.S. Navy Memorial. Though not artistic models in the strictest sense, archival photographs and period graphics have informed the early design work. The characterizations and postures for the two free-standing sculptures are still under consideration. Each will be set upon a granite-capped concrete pedestal in the form of a regular hexagon. The six sides of those pedestals will serve as the display surface for the two bas-relief series. The central locations of those monuments will allow groups and individuals ample access to all the sculpture, scale notwithstanding. Work on this stage of the sculptural program will proceed as underwritten. As it does in all but the fourth stage of the Memorial Sculptural Program, the heroic scale dominates the fifth. Among the central figures, if not the central figure, of the twentieth century, George C. Marshall has an overarching presence in the historical landscape that surrounds D-Day. 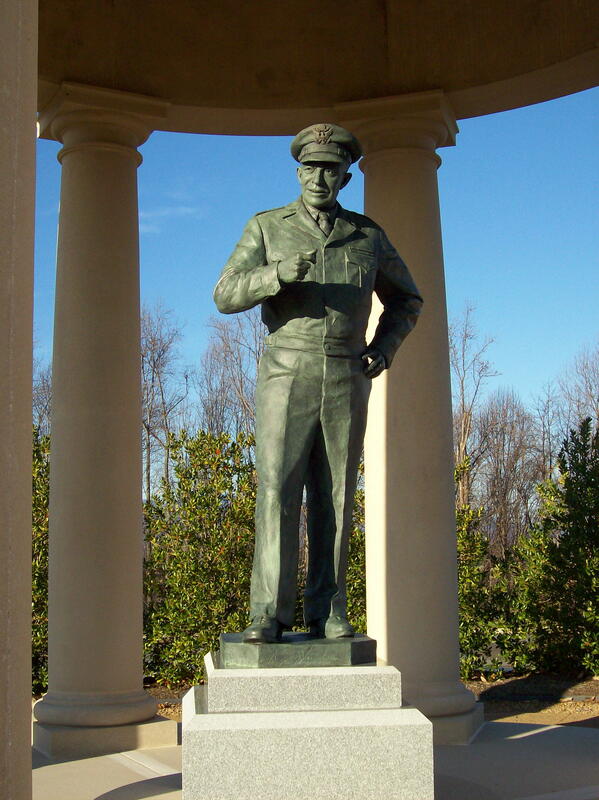 A full-figure sculpture of General Marshall in his role as Secretary of State will be set upon a granite pedestal at the entrance to the Memorial’s interpretive facility. Secretary Marshall’s State Department portrait presents him seated. His sculptural presentation has yet to be determined. The completion date for stage five of the sculptural program remains open as well. That date probably will not be set much before the Memorial’s interpretive facility is constructed and in full operation. Like the fabled tortoise, this Foundation presses ahead, executing its memorial mission as well as resources will permit while working to complete and secure the Memorial. Owing to the valor, fidelity, and sacrifice of donors great and small, volunteers, directors, and staff, the Foundation has managed to take care of much of its old business. For instance, the Foundation has satisfied all the obligations incurred for construction of the Memorial and restored, with full interest, its endowment funds. Like the erection of the folly and the emplacement of the Eisenhower monument, those accomplishments have occurred with little drama or fanfare. Each was provided for in the strategic benchmarks the Board of Directors adopted in 2004. 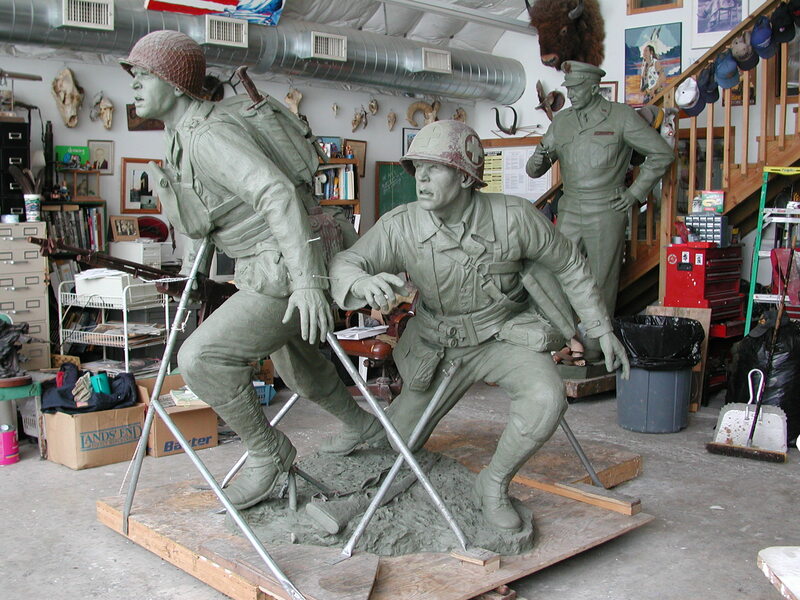 Other projects, especially those related to the D-Day Memorial Plaque Program, move ahead at a similarly deliberate pace. Each additional plaque, each new sculpture represents another forward step toward the goal of completing and securing the National D-Day Memorial while also strengthening the Foundation’s ability to preserve the lessons and legacy of D-Day. Those desiring information about some of the ways in which they might participate in taking care of business associated with the plaque or sculptural programs are invited to contact the Foundation by post, e-mail, or telephone. For all the challenges encountered during the early years of the Memorial’s operation, the National D-Day Memorial Foundation has not faltered in the execution of its educational mission. Nor has the Foundation lost sight of its responsibility to operate in accordance with the best business practices and in compliance with the laws and regulations that pertain to not-for-profit corporations. The Foundation keeps faith with its supporters, large and small, honoring their instructions and delivering the stewardship that is their due.